Jay Cradeur with The Rideshare Guy created a great video that is all about Mystro. Jay gives his personal review of the app, and shows you how to use it to filter ride requests for Uber and Lyft. Currently Mystro is only available on Android phones. Take a look at Jay’s video to see Mystro in action, then scroll to the video transcript to see all the points he covers. What is Mystro, and how much does it cost? Now I don’t have an Android phone, I only have an iPhone. I haven’t been that interested in pursuing it, but the folks at Mystro sent me this fancy little model phone and I got to kick the tires, give it a shot. Let’s get started. Mystro is an app which you can purchase for a monthly fee (currently around $11), or you can pay for it by the year and get a decent discount on the monthly rate. Now the purpose of this app is to make it simpler for rideshare drivers to accept and decline rides. The way it works is really simple. You install Mystro. You set your preferences. You then go out, put your phone to work. You hit the Mystro button. Everything starts up. It accepts your first ride that you get, and then it turns off the other app. Let’s say for example you get a Lyft ride, then it’s going to shut off Uber for you. Let’s go into some of the details about Mystro and let’s break down some of these screenshots so you can see exactly what this baby could do. This is the home screen. This is where you select your apps. You also indicate your primary app, the one you want it to open first. Then you can also set a time delay as to when you want your second app to open. The sleep button at the top is what you hit when you want to not use Mystro. You click that when you want Mystro to start. This then is the second screen, which is where you select the types of rides you want to accept. Many drivers don’t like Lyft Line or Uber Pool, so here you could just turn those off. Any request that come in for those will be automatically declined. That’s pretty cool. Now we get to the next screen which is where you indicate your preferences. This is where you would select say 10 minutes. You don’t want any rides that are more than 10 minutes away. That’s the acceptable time for a passenger pickup. Then you can also indicate acceptable passenger rating. Let’s say you don’t want to take any passengers that are lower than a 4.6. Then you can also indicate what surge you’re willing to accept. Let’s say you’re in a high surge area and you will only accept a surge of 2x. This is where you would indicate that right there. Is Mystro actually useful for drivers? Those are some pretty cool bells and whistles, but the question remains, how useful is Mystro? I believe there are four factors that can help you decide if this is something you want to purchase and incorporate into your rideshare driving experience. The first factor is the market that you’re in. I’m in a market, San Francisco, where it’s quite busy. I rarely get a ride where I have to drive 10 minutes, so that feature of Mystro wouldn’t be so useful for me. You may be in a smaller market where things are more spread out and you consistently get longer rides that you don’t want to take. Mystro would just really save you a lot of time and take care of all that decision-making right upfront. The second factor is the providers that you use. Now for example, I drive in San Francisco and I constantly consistently get the Lyft Power Driver Bonus, but it’s dependent on me maintaining a 90% acceptance rate. I would never decline a Lyft ride unless it’s a very specific criteria. I want to accept everything that I can. However, you maybe in a market that just has Uber where the acceptance rate doesn’t really matter in terms of bonuses. In that case, it makes much more sense to use Mystro. If you use both, again then it makes sense to use Mystro. I’ve been driving a long time. Two years now. I’ve gotten 16,000 rides, so I’ve been switching apps quite a bit. 16,000 times or so. For me, it’s second nature. If you’re starting out new though, that might be a little uncomfortable for you. Mystro would definitely solve that problem for you because it’s almost transparent. It just accepts and declines. You don’t have to think about it. You don’t have to push any buttons. You don’t have to be focused on your phone. If you’re newer, I would say definitely take a look. The fourth factor is what call situation analysis. There are certainly times where Mystro would have been great for me. For example, on New Year’s Eve where I would driving for Uber and the surge was really high, like around 500%, well, if I could set the surge rating to only accept rides above say 400%, then I wouldn’t have to be declining, declining, declining until I got that 400% surge. In situations like that, Mystro would be really, really great. What I’m going to do next is I’m going to show you some videos of me doing it old school and then me doing it with Mystro, and then we’ll come back. As you can see, I have one more. I’ve got 19 of 20. I need one more ride to get my $70 bonus. You’re going to start off going online with Uber, and then we’re going to online with Lyft. Now we just wait. Now when I get a ping, what I’m going to do first is close the app that I’m not using. There we go. I’m going to close that one. Then we’re going to go in on Uber and we’re going to accept. Then I’m going to press navigate and go now. Now let’s see if we can get a Lyft ping. I’m going to go online with Lyft first, and I’m going to go online with Uber. I’m going to set Lyft in front. I am ready. There we go. I’m going to accept right away. I’m going to close down Uber. I’m going to hit navigate, and we are on our way. Let’s fire up Mystro next. It’s pretty cool because it starts both Uber and Lyft at the same time with just one little button push. I’m going to go off of sleep. It fires up Uber, then it fires up Lyft. I had my destination filter on, so I’ll turn that off. We’re ready to go. Just like that. Pretty slick. Now we’ll wait for our first ride. There it is. It automatically accepted it. It’s firing up my Waze app. We are off and running. Now let’s just take a quick look and we can see that the Uber app is offline. Automatically turns it off. Pretty cool. Let’s go pick up the passenger. Let me go back to Lyft, say I’ve dropped off the passenger. Confirm drop off. I’m going to give her five stars. She was awesome. Submit. The Lyft app is back on ready to roll. Let’s double check that the Uber app is going to go back online. No, I guess not. There she canceled. This is great. You get to see all of this. Let’s go back now and see that the Uber app is turned back on. I’m going to put my Lyft back in front because I like it like that. We’re off for our next passenger. There we go. Another Lyft passenger. You can see it just turned off the Uber app. It makes turning apps on and off a little bit smoother. What was interesting to me was when I started to use Mystro, I absolutely loved it. I love technology and I loved the freedom that it gave me to just drive around. I mean really I didn’t have to do any of that. I really wish it was on the iPhone. If you have an Android, by all means, download Mystro. Try it out. You can always drop it if you don’t like it. I found it to be very uplifting and I had more time to talk to my passengers and look out window and enjoy the scenery. It just took one little less task off my list. I became a big fan once I actually used the app and started driving around. If you like this video, go ahead and check that off. 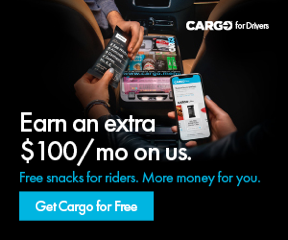 If you haven’t subscribed yet, by all means, subscribe because you’re just going to be constantly inundated with good content, good information about rideshare driving. This is Jay Cradeur. You all have a great day out there. What’s the difference between rideshare insurance and commercial insurance?